JJesper Skibsby’s life journey has taken him from working at a sea shipping company in Denmark to “shipping” a music tech startup, which is now the most accessible platform for tracking radio airplay. WARM, standing for World Airplay Radio Monitor, claims to be the first large-scale airplay monitoring service built specifically to serve individual musicians. 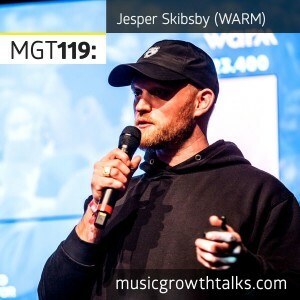 On this Music Growth Talks episode Jesper explained the technology behind WARM, and how they manage to track song plays even on small radio stations across the globe. You may be surprised where your tracks are being played. He also talked about two general reasons why you would want to monitor worldwide airplay for your songs, and reminded us that the music is truly global these days—meaning you, as an artist, may see more success with your genre internationally than locally. Listen to this podcast episode in full to also hear Jesper’s thoughts on how difficult it is to put a monetary value on a single radio spin, yet how many insights you can gain from one at the same time.